By Miłosz Panfil - PhD and Dominik Czernia - PhD candidate. 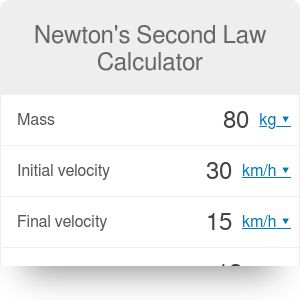 The Newton's second law calculator is a perfect tool that helps you understand the second law of motion due to Isaac Newton. Have you ever wondered what is Newton's second law of motion or how to calculate a force acting on an object? The following short article comprises all the answers. Issac Newton was an English mathematician, physicist, and astronomer who is mostly known for his law of universal gravitation. Legend says that Newton sat under an apple tree when suddenly an apple felt on his head made him realize that the fall of bodies to Earth and the movement of celestial bodies, is caused by the same force - gravity. The second law of motion - this is what our Newton's second law calculator is about. For example, this law explains how to calculate force knowing the acceleration of the body. The third law of motion - when one body exerts a force on a second body, the second body exerts a force, that is equal in magnitude and opposite in direction, on the first body (to every action there is always opposed an equal reaction). m [kg] is the mass of an object. Above law says that objects accelerate due to force acting on them. The effect of the force, the acceleration, depends on objects inertia: the unwillingness to change the velocity. The larger the mass, the larger the inertia. F = m * (v_f - v_i) / dt. dt [s] - the time it took to change the velocity. With this formula, you can compute force you were looking for. You can also turn the equation around and ask what is the change of the velocity if you subject an object of mass m to the force F for dt seconds. There is a related concept to the force which is the impulse. Check the impulse and momentum calculator to learn more about it! Computing the force is very easy with our Newton's second law calculator. Let us calculate the force it takes to stop a moving car. The car weighs 3500 lb (1586 kg) and moves with the speed of 60 mph (97 km/h). To stop it in 20 s you need a force of -2129 N (check force converter for different measures of force). The minus sign signals that the force is acting opposite to the motion of the car: it's stopping the vehicle. If you're interested in the physics of cars, check what happens during a car crash. Wondering where the car's center of mass might be? You don't have to wonder anymore! There is our car center of the mass calculator. Miłosz Panfil - PhD and Dominik Czernia - PhD candidate. Newton's Second Law Calculator can be embedded on your website to enrich the content you wrote and make it easier for your visitors to understand your message.